Each piece of beautiful reclaimed Texas Mesquite or Pecan will measure 12" to 18" in width (varies according to knots, areas where branches grew, etc) with 2 LIVE EDGES and approximately 2, 3, 4, or 5 feet in length. See length variation to select desired length. Thicknesses will range from about .5" up to about 1". After signing by guests, piece may be hung, leaned against a wall or laid flat. Please advise intended final use and we can attach hanging hardware or felt feet to prevent scratching of surface it will occupy (if desired). Using reclaimed Texas pecan or mesquite, these are lovely as a Guest Book alternative for a wedding, party or other special event. It is completely sanded on one side to a smooth finish to allow easier writing. It also has one layer of polyurethane finish. For best results, we suggest using a "sharpie" type permanent marker in a metallic or black color. 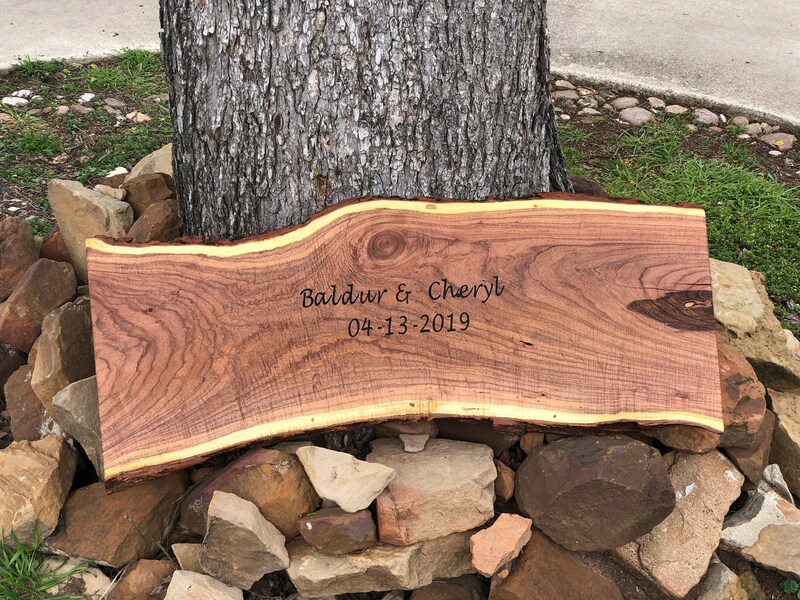 As we now have a new laser engraving machine, this listing INCLUDES laser engraving of your names and date on the wood slice. Additional text will be quoted as necessary. Please include desired names and date in the notes to seller area upon checkout. The engraving on the sample reads "Welcome to our special day", or "It was always you", but you may choose anything you wish. Available widths will be no less than 12" and up to a maximum of 18"
As you can see from the photos, these are "imperfectly perfect" - trees can grow in some unusual shapes and are rarely perfectly shaped. Each is unique, but as beautiful as these shown. If you would like a photo of the piece I select for you, please leave me a message in the “note to seller” section upon checkout; and include your cell p hone number. Item will ship by FedEx Ground. Shipping will be combined if possible on orders of more than one piece. But, please be aware these are not only bulky, but very heavy. Convo me for a reserved listing on multiples if desired. Local pickup of multiple pieces is available, welcome and encouraged. Please convo me for exact location specifics (Central TX). Shipping is estimated using a 4 foot piece - shorter pieces will have potential shipping refunds, longer will have shortages which will be invoiced separately if necessary. This is a completely natural wood product. You will find some saw dust residue on them, the bark will flake and/or peel somewhat. There may be some areas where the bark is completely gone. The surface may also lightly crack as it dries out. It also smells like mesquite. Some very brave bugs may also make their way to you (although this has never been reported). We are literally cutting these from our woods and shipping them to you! None of this will affect their intended purpose and is completely a natural characteristic of a fresh cut wood product. Just want you to know.